Wishing you all a super wonderful 2012 filled with happiness, prosperity, health, friendship and love! Since this is my first post this year, I wanted to make something a bit different. But when it’s cold like it is now (at my house the thermometer reads 18°F right now brrrr), the only thing to do is make some yummy soup, right? But since it’s early January and everybody is trying to eat lighter and healthier, a stew or thick soup did not seem like the way to go and anyway, I like to be reminded of warmer days or at least warmer parts of the world and since I have some time between chores (cleaning the house has to be done this year too, really?) 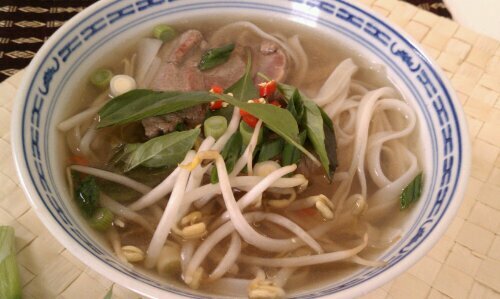 I am making myself Pho, Vietnamese Beef Noodle Soup from scratch. Traditionally , or I should say normally in restaurants, this soup is clear and very lean since the fat gets skimmed off while the flavorful broth is cooking, but you could leave some of the fat in the soup like I did, for the cold winter weather’s sake. If you’ve ever had this in a restaurant, you might be familiar with the washtub sized bowls one gets served. I am not kidding, seriously big enough to wash your head in, and no one I have ever been to a Vietnamese restaurant with has EVER been able to finish one of those, and there were a few hungry guys amongst those counted not just dainty ladies. So that said, the recipe makes enough for 6 to 8 meals, the lower number for bigger bowls, the bigger number for more normal appetites. Drain, rinse the bones and clean the pot then return the blanched bones to the same pot, add 6 quarts of water and bring to a boil, skim off any fat and foam that forms on the surface. Add another 2-4 quarts of water and return to a boil, again skimming off any impurities that rise to the surface. In the meantime, stud the shallots with the cloves, and roast both the ginger and the shallots either by holding them over the gas burner until blackened in spots or by placing under a broiler. Place the spices, ginger and shallots inside the muslin spice bag (alternately using two layers of dampened cheesecloth, wrap all the spices and tie shut with kitchen twine). Place the spice bag in the stock pot with the bones and simmer for 1 hour. Then remove the bag and discard. Remove the brisket and set aside. Return to a simmer and cook, uncovered 4-5 hours, adding water as necessary to maintain the water level and making sure to keep the bones covered at the minimum. In the meantime, after placing in the freezer for 30 minutes slice the flank steak paper thin against the grain, also slice the reserved meat paper thin, set aside. When the broth is ready, remove and discard all of the bones. Strain broth through a colander or strainer, lined with a double layer of dampened cheese cloth into a clean pot. Return to heat and add the fish sauce or salt, bring to a boil then reduce the heat and keep the soup at barely a simmer while you are getting everything else ready. 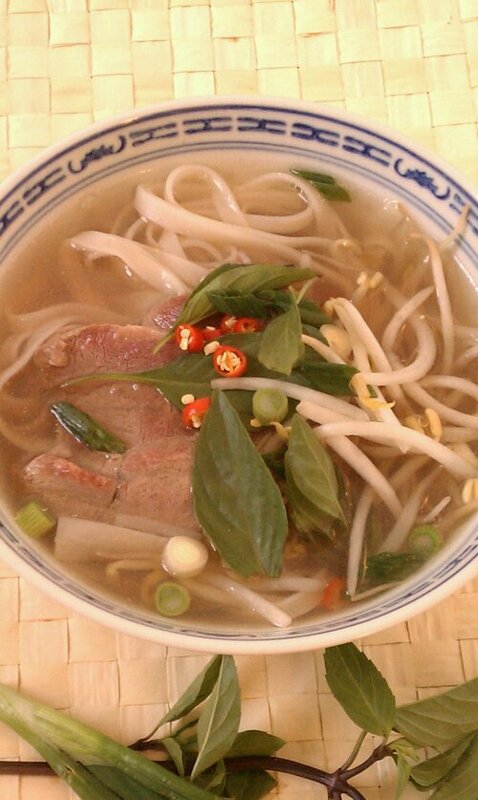 Divide the softened rice noodles among 6 to 8 large soup bowls, top with the sliced meats. Bring the soup to a rolling boil then ladle the soup directly over the meat in each bowl, cooking it instantly. Garnish with a handful of bean sprouts, some scallions and a lime wedge. Let everyone garnish their own soup to their liking with additional mint, basil and cilantro leaves, sliced red chile peppers. You can also make a large batch of broth and freeze some for later. I use quart size zip top bags that I sit inside a square container, fill with soup, freeze and remove the bag from the container. Stacks easy since it is square in its frozen shape. 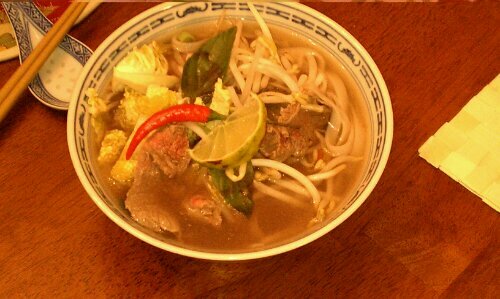 When you’re in the mood for some Pho, you just have to get the steak sliced, get all the garnish ready: sprouts, herbs, chile, lime and rice noodles. 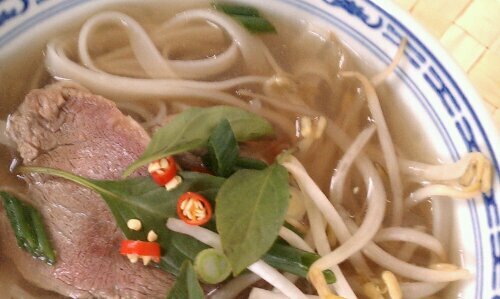 oh wow, i LOVE pho! buuuut…. 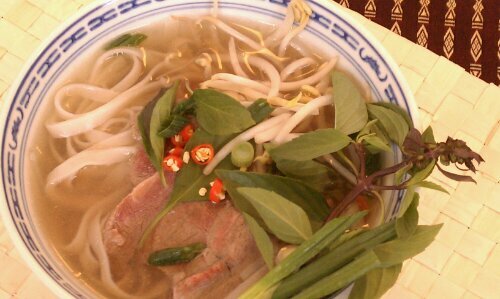 i think my favorite part about pho are the jars of spices, chilis, herbs, and hot sauce that you dabble on! there’s something so much fun about dressing up your dish in tons of beautful colors and flavors! Yeah I know, the sauces and garnishes are AWESOME, but since at home I don’t have all of that good stuff, this time I only used the chili garlic sauce I got. It’s very true, like you say, food needs to look pretty too, tastes way better then!